Let’s get serious. Buying toys for babies can be a bit ridiculous. Now, I’m not saying that I don’t go out and purchase toys. But, it gets to be pricey when they literally pick the toy up for two seconds and are bored. Babies around 6-12 months have short attention spans. So why spend loads of money on toys they will a) never use again and b) get bored with in seconds? Besides, babies LOVE household items. Pots & Pans & Spoons & and other household things = A genius idea. If you are a parent of a lovely adorable short attention span person, and looking for ways to save some extra dough- Go shopping in your own home! 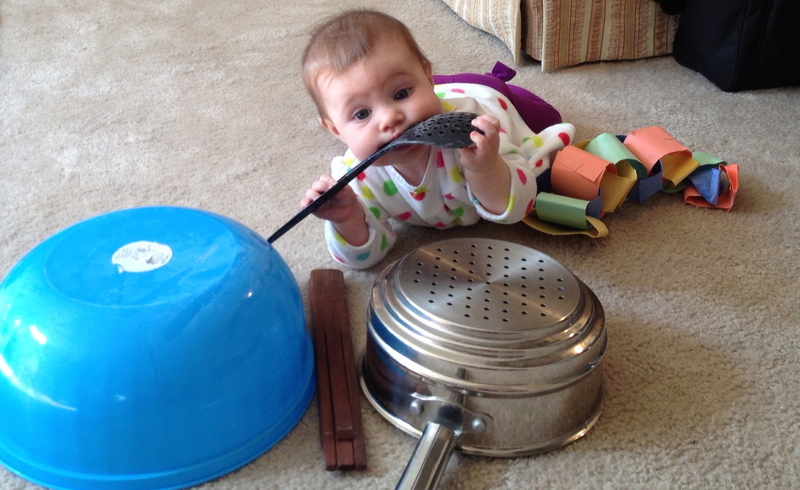 Pots, pans, spoons, tupperware of different sizes – all these things are great examples of items your little one will love! Previous Post McKinley’s First Moccamus! Yay!! Thanks elskenewman for stopping by!